Udaipur, otherwise known as ‘City of the Lakes’ is a beautiful stop on your way through Rajasthan. Although popular with all kinds of tourists, Udaipur maintains a sense of peace and has options for chilled out days as well as busy sight-seeing. There are lots of things to see in Udaipur and most of them are concentrated around the lake area so you knock off most of the main places to visit in Udaipur in a day or two. But the relaxed vibes, great food and lake views will make you want to stick around longer! If you have some more time to explore the beauty of Rajasthan, check out our full Rajasthan itinerary with recommended places to see! View over the beautiful city of Udaipur. See the city from one of the rooftop terraces is one of the places to visit in Udaipur. Udaipur is in the south of Rajasthan and is well connected by bus and train to Jodhpur, Jaipur and Pushkar. There is also an airport with cheap flights to bigger cities such as Mumbai, Delhi and Bangalore. The Udaipur City Palace is one of the best places to visit in Udaipur. 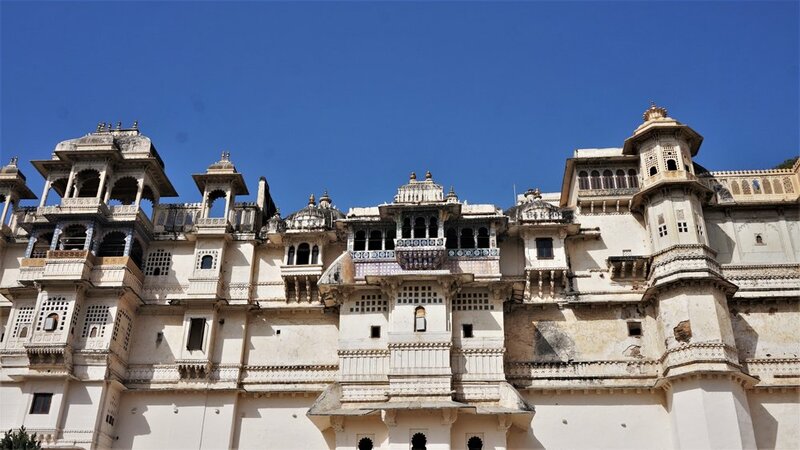 This palace should be on your list of things to do in Udaipur! This is a stunning palace and maybe one of the most enjoyable attractions we visited in Northern India. It takes a couple of hours to fully see the palace and it’s best to visit first thing in the morning (opens at 9.30am) to avoid the big crowds of tour groups. A guide isn’t necessary but you can get one for around 200 INR if you are interested in hearing more about the palace. There are also audio guides available. Bagore ki Haveli museum is one of the most interesting places to visit in Udaipur. Things to do in Udaipur. This gorgeous building houses an eclectic mix of exhibits and is a fun thing to do in Udaipur if you have the time. From a puppet collection to one of the world’s largest turbans there’s a lot to explore while wandering the rooms and grounds of this old haveli. We also like the wedding exhibition which explained the customs of an Indian wedding. 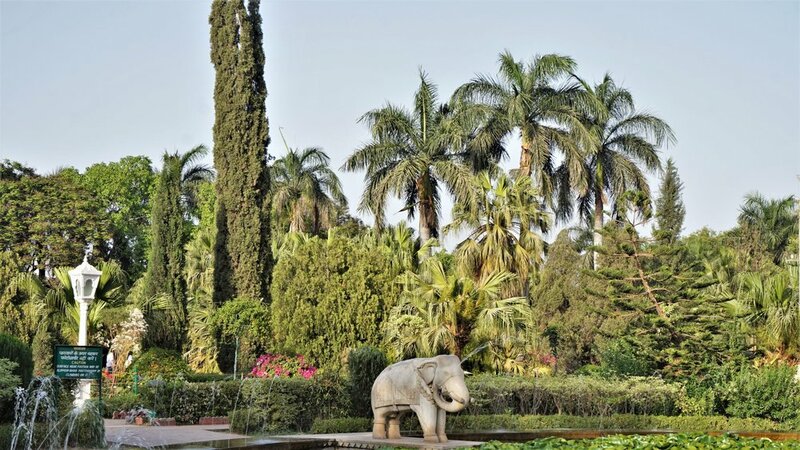 Saheliyo Ki Bari garden is one of the most beautiful place to visit in Udaipur. This little park is a beautiful haven in the busier part of the city. It’s very small but the well-manicured gardens and impressive fountains make it a peaceful place to visit in Udaipur for a wander. You can even bring a picnic and sit on the grass. One of the best places to visit in Udaipur is the Fateh Sagar lake at sunset. One of the other lakes in Udaipur, we found it just as stunning as Pichola Lake but without the foreign tourists. Around sunset Fateh Sagar is bustling with local families, couple and groups of friends eating, chatting and wandering along the lake front. There’s a line of street food stalls with plenty of eating options and boat rides that are cheaper than on the main lake. This point is a tuk tuk ride or a long walk from the town with a cable car at the end but is meant to have some stunning views over the lakes in the area. We didn’t make it up here but people from our hostel said it was really worth it. Here’s the location. Take a trip with the boat on the lake at sunset is one of the best things to do in Udaipur. The view from the other side of the lake is one of the best places to visit in Udaipur. Taking a boat tour on the Pichola Lake sounded like a nice idea until we saw the groups of tourists piled into boats in fluro orange life jackets. The views are probably great and if you go during the day the lake is less crowded and the tour looked quite peaceful. At sunset everyone is out on the water and the tour prices almost double so I recommend finding another spot to sit and enjoy the magical sunsets in Udaipur. Watch the sunset over the lake is one of the best places to visit in Udaipur. The lake combined with the deep orange sunsets of India make for some stunning evening views. Find yourself a rooftop or head to the popular sunset point near the Manji Temple to join some locals watching the sun go down. There are many places to visit in Udaipur if you want to find some nice clothing. Because it’s a popular tourist town, Udaipur has some great gift and souvenir shops. There are also a number of clothing shops selling tailor made items. A wander through the town on either side of the pedestrian bridge will give you all the options available at prices to be heavily negotiated. For more shopping inspiration read this guide on shopping in Udaipur. We had a very comfortable stay at Moustache Udaipur in a private room. They also have affordable dorm rooms, an upstairs restaurant and arrange daily tours and activities for guests. For a more upmarket option we heard great things about The Neem Tree. There are some very nice places to visit in Udaipur if you like good and healthy food. This restaurant has a great range of vegan and vegetarian options made from locally sourced, organic ingredients. They also run cooking classes. A cute little bakery-café next to the Bagore ki Haveli Museum. Good coffee and delicious baked goods. They also run a restaurant which is on the pricey side but has an incredible menu. Serves great coffee and a good range or breakfast and snack options. Try the brownie with ice cream. Maybe the best place to visit in Udaipur, besides all the cultural sights I mean!